I made these sweet bread puddings as a surprise dessert for Matt the other night. This was my first time making a sweet bread pudding & I'm not sure why I waited so long. These puddings bake up thick with custard and are oh so rich. They puff up as they cook making for a wonderful presentation. I used ciabatta bread in this but I think any white or light wheat bread would work. Mix the bread cubes & diced apples together. Place in four individual ramekins. Beat the eggs. Whisk in the sugar, vanilla, cinnamon, nutmeg & a pinch of salt. Stir in milk. Pour the egg mixture evenly over the four ramekins. Use a spoon to press the bread down into the mixture to soak it in. Let sit for 30 minutes. Preheat the oven to 375 F. Sprinkle a little cinnamon & sugar on the top of each ramekin. Place the ramekins in a water bath & bake for 60 minutes until they are golden brown & the custard has set. Mmmmm. I'm thinking Challah, or cinnamon bread. Thanks for another great apple recipe. I LOVE SWEET BREAD PUDDINGS! Love this. I also like the fact that there is no butter in it. Hi! Just started reading your blog this week. Love it! I grew up with sweet bread puddings and they are one of my favorites. I haven't had a variety with apple in it though. This sounds great. mom24 - Cinnamon bread would be awesome in this. 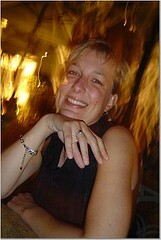 lori - welcome, glad your enjoying the blog! This looks so tasty! What size ramekin did you use? Maggie - The ramekins I used are 1 & 1/2 cup. These puddings were so rich though that next time I'd use a smaller ramekin, maybe 1 cup for each serving. Kat-This sounds delicious and seems like the perfect way to use all the great apples at the farmers' market (and extra homemade bread when it cools off enough to start baking again0. 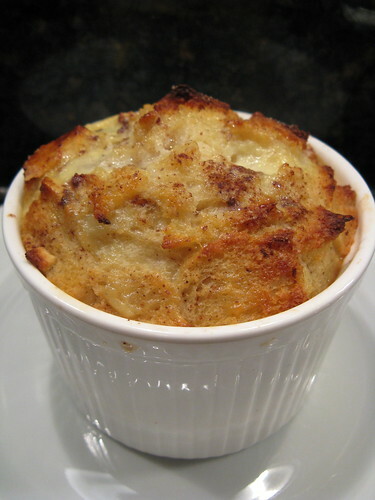 My husband loves bread pudding, so I should make this for him! I love bread pudding and I would never have thought about adding apple to it. All of your apple recipes look so good! ahhh, milk, bread and eggs. Now wouldn't this be a nice dessert to present this fall? Off to get apples. I'm liking all your apple posts.. Keep em coming! I made something really similar to this. It's an apple cornbread pudding and it's really easy b/c you use already made cornbread and apple cider. I can't wait to try your recipe. Thanks. My kids will love this. Every time they see me busy with my ramekins they know I am making something special. They love apple treats.